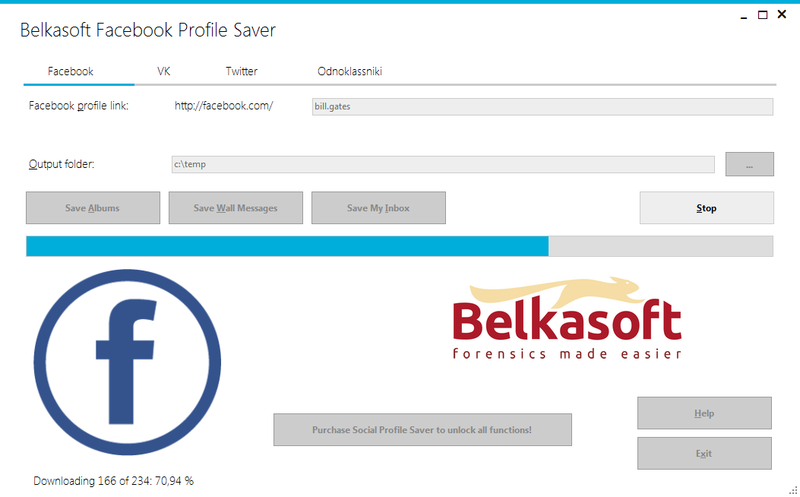 Belkasoft Facebook Profile Saver is a free tool to save the content of Facebook users' profiles for offline use. Designed for computer forensic and IT security specialists, Belkasoft Facebook Profile Saver automates the routine of downloading Facebook pages and resources for offline examination and printout. Local copies of Facebook profiles can be used as court evidence. Belkasoft Facebook Profile Saver can extract and save publicly available photo albums including comments and descriptions, as well as Facebook the users' wall contents including all text and images. At this time, only text and images can be saved, no videos or other uploaded files. Saving the many files available in users' public Facebook profiles can be an extremely time-consuming operation if performed manually. Belkasoft Facebook Profile Saver automates the entire process, turning the routine into a one-click operation. Belkasoft Facebook Profile Saver stores all information locally, producing self-contained HTML report that can be viewed offline without an Internet connection. These HTML reports can be printed and presented as evidence if required. The reports maintain all the original links, allowing investigators to review the original album and photo pages or wall posts at a later time. Belkasoft Facebook Profile Saver supports Facebook authentication, signing in automatically if a Facebook login is required. Many Facebook users only allow viewing their pages to other Facebook users. If this is the case, Belkasoft Facebook Profile Saver will request Facebook login credentials, and use the supplied login and password information to access the restricted resources. Investigators are advised to use freshly created Facebook accounts to log in.